Saturday morning in Stirling at the King Robert Hotel, and we once again kicked off our day with a Scottish breakfast, although we both picked at it, as it was a might bit greasy. It didn’t seem to bother the locals, but its just not the way we normally eat. Perhaps a scone a little later in the day will be in order. But first, we have a 10 o’clock appointment at the Battle of Bannockburn Interpretive Centre, next door to the hotel. I’m not going to run through the entire history of the battle itself, if you are interested you can always look into it. Instead I’ll tell you about the 90 minutes we spent at the Interpretive Centre. When we first checked in, we were surprised to find that there was only one other couple booked for the 10 o’clock tour, and to call it a tour is a complete misnomer. It is in fact a two-part show which put us right in the thick of the battle. To begin with, we were given 3D glasses, and told to go into the theatre. Inside there were three screens and the four of us were told to position ourselves in the center of the room. A narrator (guide) entered the room and told us to watch the action develop and take place around us. Battle scenes have been recreated by the Centre for Digital Documentation and Visualization, in partnership with the The Glasgow School of Art’s Design Studio. Using motion capture technology, actors used prop weapons to engage in a real fight provoking genuine reactions and emotions that were digitally captured, and then used to realistically animate 3D battle characters. I’m sorry the pictures aren’t crystal clear, but hopefully you get a sense of what we saw unfolding around us. The narrator told us about the weaponry that each side had at their disposal, and the 3D battle characters showed us how they worked, which meant arrows were flying past and through us from all directions. We then stood in the middle of the battle and watched Robert the Bruce and his men soundly defeat the English army of Edward ll. The second half of the show involved us going into an adjoining room and engaging in a simulated battle pitting the English against the Scottish to see if we (the four visitors) might make strategic moves that would bring the confrontation to a different conclusion. I was assigned the role of Edward ll and charged with leading my English troops in an attempt to defeat the Scots by capturing Mary Queen of Scots, who of course was assigned to Mary Stanger. My English heritage is well known to friends and family, so it seemed entirely appropriate that I end up on that “team”. Less known among our friends is that Mary is descended from the McGregor clan (on her mother’s side), which meant placing her on the Scottish team was entirely apropos. The narrator also set it up as the men against the women to add an extra element of “fun” to the battle. Back and forth we went, moving our knights, foot soldiers, war horses, and archers, all against a clock and a set number of moves. When all was said and done, I, Edward the ll had cornered Mary Queen of Scots who was left with only 14 men out of the 10,000 she had started the game with. However, by the rules of the game, even though she was completely outnumbered and trapped, she had not been caught, so the Scots had once again won the battle. Good thing too, since Mary does the driving and had the car keys in her possession. Before leaving, we had a chance to go and try on various types of armor, and wield a host of different types of weaponry. Man, some of the stuff was really heavy. I don’t know how they kept their heads upright in some of the gear. It was great fun. ARTHUR: I am, and this is my trusty servant Patsy. We have ridden the length and breadth of the land in search of knights who will join me in my court at Camelot. I must speak with your lord and master. SOLDIER #1: You’re using coconuts! SOLDIER #1: You’ve got two empty halves of coconut and you’re bangin’ ’em together. Doune Castle was used to shoot most of the scenes in the 1974 movie, Monty Python and the Holy Grail, but it was not originally planned that way. The Pythons had planned to shoot in a number of different Castles throughout Scotland, and prior to filming, had a deal in place to do so. Once the authorities had a look at the Pythonesque script, they got cold feet, and cancelled the agreement. Fortunately, the privately-owned Doune Castle, a 14th century fortification about ten miles northwest of Stirling, was up for the challenge. The use of basically, a single location necessitated a bit of imagination, with Doune standing in for almost every castle seen in the film. The audio guide we picked up for the tour was narrated by Terry Jones, who moved back and forth between telling us the “real” history of the castle, and relating stories about the movie. Being such Python fans, Mary and I kept looking at each and laughing each time an audio clip was suddenly inserted into Jones’ commentary. If you are not familiar with the movie, then the next few paragraphs and pictures won’t mean much to you. But if you are, I hope you enjoy them as much as we enjoyed wandering through the castle. This room is the Great Hall. This is the room where the “Knights at the Round Table” at “Camelot” scene was filmed. And of course (below ) this is the staircase that saw John Cleese run up the stairs killing everyone in his way, as he first entered the castle intent on disrupting a wedding. As that scene moved inside the castle, the Great Hall was once again used. By the way, you might just be able to make out on the sign at the base of the steps, that coconuts could be purchased in the gift shop. 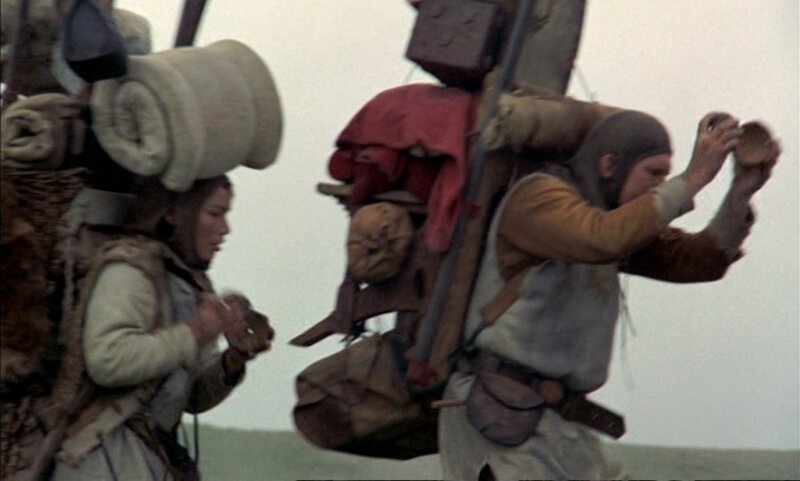 In the commentary, Terry Jones said that many of the people who appeared in the court scenes were in fact tourists (300 in total) who happened to be visiting the castle on the day the scenes were shot. The courtyard as it looks today is seen below in a photo I took from the roof the castle. I have about 50 more photos taken at Doune, most of which relate to other notable scenes in the movie, and Mary and I are not alone in making the trip to visit the site of the Holy Grail Movie. Doune Castle has become a place of pilgrimage for fans from all over the world, and an annual “Monty Python Day” is held at the castle. Oh, and it’s not just the Pythons that used Doune Castle. A variety of locations have been used to create Winterfell in Game of Thrones, but Doune Castle was the first. The Scottish castle was also used for exterior shots and the great feast held when Robert Baratheon arrived in the pilot episode. Starring as the fictional Castle Leoch in the first season of the Outlander, Castle Doune has seen a 44% increase in attendance in the last 2 years thanks to fans flocking to Outlander filming locations throughout Scotland. Before I leave Doune, I should note (with tongue in cheek) that it did have a history before 1974. It was originally built in the 13th century, but was badly damaged in the Scottish Wars of Independence before being reconstructed into its present form, late in the 14th century. By 1800, the castle was ruined but restoration works started in the 1880’s and as you can see from the scaffolding in the picture above, continue to this day. Leaving Doune Castle, we set off for Callander, a town that reminded us of Banff in the way that it serves as a gateway to a major tourist region, in this case, “The Trossachs”. It is a popular stopping point to and from the Highlands, and it was our plan to join those ranks. Stopping in town for our afternoon ritual (tea and a sweet), we sat in a square in mid-town and engaged in one of our favorite pastimes – people watching. I happened to spot a young lady with a Canadian flag on her back-pack, and asked her as one Canadian to another if she would take a picture of Mary and I. We are constantly on the look out for funny signs while out on our road trips, and on this day, we added a new one when we came upon this hardware store in Callander with a name that just cracked us up. First – Expect to get lost, and laugh about it when we do (and we have got lost a few times and we do laugh about it). There is always a round-about not too far down the road to get us back on track. Second – Don’t worry if we don’t see everything on our list. After all, everything we are seeing is something new, and that in itself is fantastic. Third and finally – if we get tired, take a break and settle in somewhere. There is no shame in building in “rest days”. The sites we are seeing have been here for centuries, and we don’t imagine they are going anywhere soon. Our “put the feet up” plan didn’t fall into place immediately as we were not that far from either Glasgow or Edinburgh (roughly an hour from each), and many residents in those cities like to escape for the weekend to the places that we were looking to book into. With a bit of luck and on-line perseverance, I was finally able to locate what I thought was a suitable spot – the Gleddoch Hotel Golf and Spa, about 35 minutes to the north and west of Glasgow. The staff were friendly, our room was really, really nice, and the views looking out on the course were pretty spectacular. I must confess to a little 3-wood envy, as I’m still five months away from getting back on the links after my latest rotator cuff operation. Speaking of spectacular views, check out this post-sunset scene from the front of the hotel. We are looking south and west and that is the River Clyde cutting a wide swatch through the center of the picture. After a really nice meal, ordered and consumed at a very leisurely pace, I arranged for a late-check out before turning in for the night. As we crawled into bed, we agreed that we would not plan to do anything tomorrow (Sunday), and that if we were going to move on, it would be no more than a short drive to Luss, about half-way up the west side of Loch Lomond, and only 35 minutes from Gleddoch. I was wondering when you were going to take a time out. You’ve been keeping a pretty ambitious pace since starting out. I would not be able to keep up! Don’t forget – if you don’t see all of Scotland this time, you can always return.